Second, to only Google, Facebook's popularity is threatened by YouTube in the upcoming months according to the new study conducted by SimilarWeb. For the past two years, the traffic on Facebook has declined to almost half its size and now YouTube is aiming to take up that position entirely. 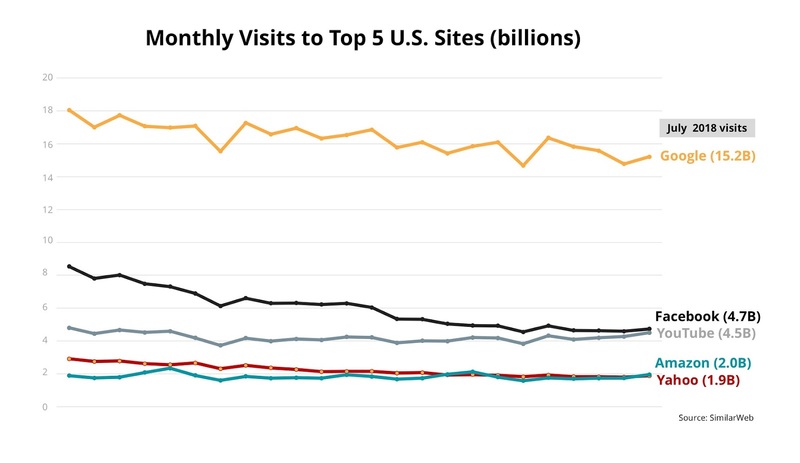 Google, Facebook, YouTube, Yahoo, and Amazon are the top five sites in terms of the web traffic in the U.S. Although, an overall growth of its traffic online, the monthly visits on Facebook have declined from 8.5 billion to 4.7 billion in the past two years as per the study. The site took a big hit when its total number of daily active users showed a flat graph in North America and went down in Europe. By the words of Stephen Kraus, author of the study and chief of insights at SimilarWeb, "Yes, Facebook.com the website is down, but they think of themselves more as a portfolio of products," meaning that Facebook website is not the only means of revenue for the company as it also owns labels like Whatsapp and Instagram which have maintained their popular status in the world of mobile apps. Google-owned YouTube has gained enough traffic in the past few months that now it is eligible to claim Facebook's position as the runner-up according to the statistics. Not only this, but Yahoo is also in line to lose its position as the third most visited site, as Amazon has already accumulated enough traffic to overcome Yahoo as a competitor. Amazon surpassed yahoo during December 2017 and July 2018 when the site held its yearly Prime Day. Yahoo is bound to lose its position in the coming two to three months. All this still doesn’t even come near to Google which has maintained its throne at the top of the scale.